This is the easiest tension headache remedy around! It is important that you are drinking at least 8-10 glasses of water per day, plus 1/2 teaspoon of added salt throughout the day. Probably the best measure of hydration is urine: it should be clear to light yellow (unless you are taking B vitamins). If you are not hydrated, your body increases its level of histamine which causes you to be more reactive to every stressor on your body, and also increases any type of pain you might feel. It also makes your muscles more tense, and it tends to activate ("turn on") your trigger points. The best way to drink the water is two to four 8oz glasses upon awakening, 1-2 glasses 30 minutes before each meal, about 4 oz with meals and the rest spread throughout the day. You should never wait to get thirsty, since a dry mouth doesn't happen until you are 2-5% dehydrated. If you weigh 150 lbs, that is 2-5 lbs of lost water!!! Your added salt should also be spread throughout the day. Click here for more information about dehydration and headaches and here for more info on dehydration symptoms. 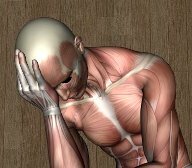 Since the muscles creating the headaches are tightened by trigger points, the natural solution would be to deactivate them. The simplest way is to find the trigger points, put pressure to mild pain and hold, wait for the pain to fade, and then push a little harder and repeat about 3-4 times per spot. Check here for a whole list of methods to get rid of them. So how do you find the trigger points that will give your tension headache relief? Choose from one of the following pain patterns. If you have pain that overlaps multiple areas, make sure to deactivate the trigger points from all areas. If the above two treatments give you some tension headache relief, but it is not lasting, then you need to consider what other factors might be perpetuating your pain. Commonly, these are things that we are doing to keep recreating the trigger points or increase our dehydration. Yes, I know you all love your coffee, but it may be creating your tension headaches in two ways: first, caffeine is a diuretic, which means it steals more water from your body than the water it is dissolved in (the coffee, tea, soda etc.). 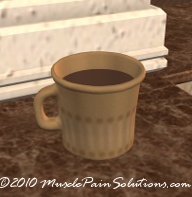 Secondly, caffeine can create headaches by itself in those that are sensitive. If you drink a lot of caffeinated beverages, you need to cut them down to a minimum to maximize your health and decrease your headaches. At the very least, I would suggest drinking an extra glass of water for each beverage you drink. Ergonomics have to do with how you use and position your body throughout the day. Poor ergonomics will irritate and recreate trigger points very quickly. This can be from the way you sleep, positions you use on the job, your driving posture, or any activity that you perform on a regular basis. Try to observe which activities tend to bring on the headache. For a more in depth discussion of ergonomics and tension headache relief, see Chronic Tension Headaches. This is where the joints in the neck and upper back, and sometimes lower in the body as well, aren't working very well, and are causing or perpetuating your headaches. This isn't last because I think it is the least important, in fact it is very important. Since this is a self help website, I am trying to give you all your other options first before having to seek professional help from a chiropractor. Not sure you have tension headaches? 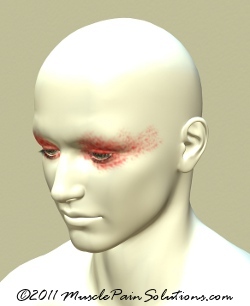 Check out the Headache Page to see if you might be suffering from another type of headache. Return from Tension Headache Relief to Home.